I love rainy days, reading by the fire, and long walks on the beach (sounds like a personals ad, doesn’t it?). Actually, my husband would correct me on that last one. He knows I actually loath long walks (or even short walks) on the beach because of the whole sand thing and the fact that sand gets into everything (I still have sand in a pair of shoes from my last trip to Hawaii – five years ago!). I don’t mind a long walk on the sidewalk next to the beach though. If there’s no sidewalk, I’ll be waiting for you right here in the parking lot where there’s less sand. For my downline swaps this month, I decided to combine my love of my friends with chocolate and came up with these cute treat bags (don’t worry, no cats were harmed in the making of these treat bags). The Bloomin Love Stamp Set coordinates beautifully with the Bloomin Hearts Thinlits. 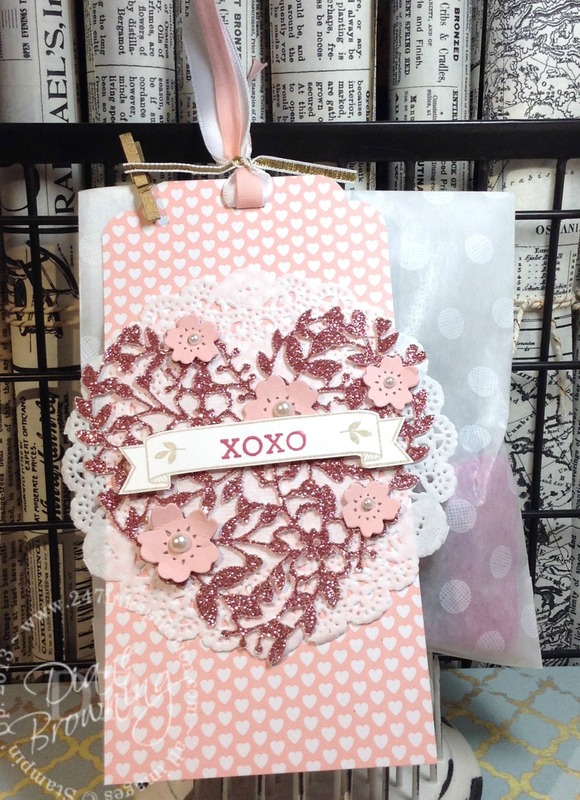 And yes, I used more of the Love Blossoms Designer Series Paper to make the tags. Everything in the “Love Blossoms” Product Suite coordinates beautifully. All the colors match and all the embellishments and dies are sized to fit together. One of the new products in the Occasions Catalog is the Blushing Bride Glimmer Paper. A whole 12×12 sheet of pink glitter paper? Oh heck yes! Come to mama! I used the Bloomin Hearts Thinlet on this pink glitter paper and it’s to die for! Talk about sparkly! The white bag is one of the Sketched Dots Bags from the Tag A Bags Line. Pearls and a white doilie complete the look. Love is both a noun and a verb. It is versatile. It takes many forms, like those long walks on the beach. And if I actually do walk on the sand for you, I must really love you.